Background: Wood develops in trees as a biological composite of three cell-wall components, cellulose (a fibrous polysaccharide), hemicellulose (amorphous polysaccharides) and lignin (a phenolic polymer). Wood has long been used for timber, paper and energy production. The production efficiency can be drastically improved using genetically tailored wood. To do that, we need to understand the genetic regulation of wood formation. Knowledge of genes underlying the biosynthesis of the three wood components is extensive. However, little is known about the regulatory system, i.e., the identity and network arrangement/hierarchy of the key regulators called transcription factors (TFs), that coordinates the expression of combinations of component genes for wood formation. We wanted to construct such a transcriptional regulatory network (TRN) using a model tree species, Populus trichocarpa (black cottonwood). Question: A TRN typically consists of 3 to 5 hierarchical layers of TF-DNA interactions. We focused on a high-level wood formation TF, PtrSND1-B1. We wanted to know how a TRN transduces the regulation of PtrSND1-B1 to activate the component genes for wood formation. Findings: Using a transient P. trichocarpa wood-cell system and 30 transgenic P. trichocarpa lines, we revealed that PtrSND1-B1 mediates a four-layered TRN, directing 57 specific TF–DNA interactions through 17 TFs to regulate 27 cell-wall component genes for wood formation. We generated quantitative information about regulatory specificity (direct activation or suppression) and strength of these 57 interactions in the PtrSND1-B1 TRN. The TRN also revealed common targets for distinct TFs, leading to the discovery of 9 novel TF–protein complexes implicated in wood formation. 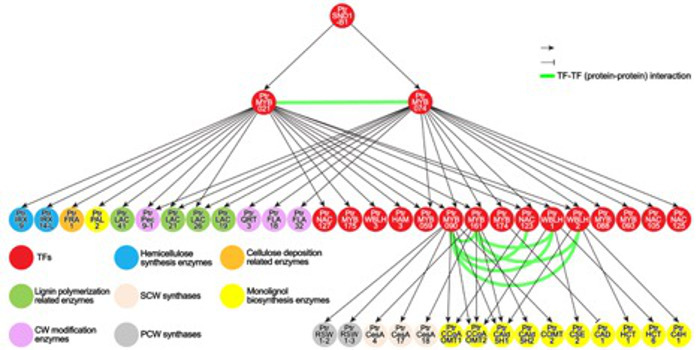 We also deduced a genome-wide AtSND-1 TRN for the model plant Arabidopsis thaliana. The AtSND-1 TRN has 50 specific TF–DNA interactions. Only 7 of these 50 interactions were found in the PtrSND1-B1 wood formation TRN, indicating wood formation is not a function in herbaceous plants. Next steps: Genetic regulation of wood formation is best studied in woody species because of their abundance and specialization in secondary xylem. The complete hierarchical TRN should be investigated further to reveal how all cell wall genes are regulated to affect wood phenotypes.